Thrive Ham Dices will add beautiful color and flavor to breakfast dishes, such as omelets. These small dices are already cooked and make a great choice in scalloped potatoes, along with a variety of appetizers and dips. Add 1/2 cup warm water to 1 cup Ham Dices; cover and let sit 15-20 minutes or until tender. Already diced, they're a quick fix for a baked potato bar, omelets, or soups. 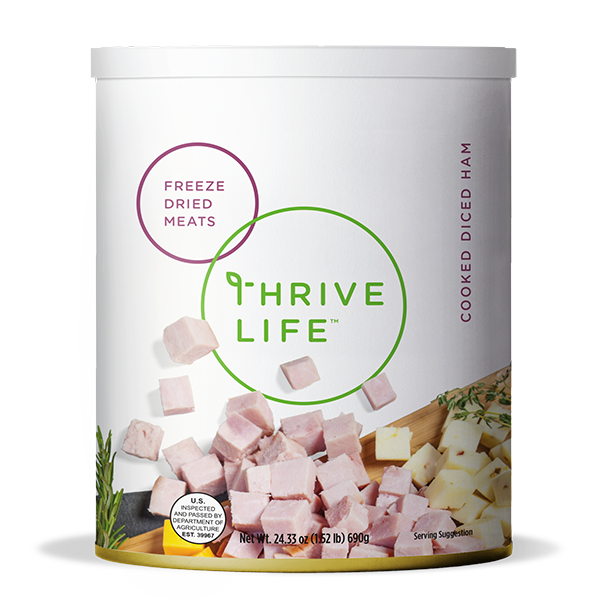 Cook them up with THRIVE veggies, Scrambled Egg Mix, and rice for ham fried rice in minutes.